In 2-quart saucepan, mix blueberries and granulated sugar. Heat to boiling over medium heat, stirring occasionally. In small bowl, mix cornstarch and water. Stir into blueberry mixture. Return to boiling over medium heat. Cook 2 minutes, stirring constantly, or until thickened. Remove from heat; stir in lemon peel. Cool completely, about 45 minutes. Line cookie sheet with waxed paper. Remove pie crusts from pouches; unroll on lightly floured work surface. Roll each crust to 12-inch round. With 3 1/2-inch round cutter, cut 9 rounds from each crust. Brush crust edges with water. Spoon about 1 heaping teaspoon blueberry mixture onto center of each crust round. Fold dough in half over filling; press edges with fork to seal. Place pies in single layer on cookie sheet. Freeze 1 hour. In deep fryer or heavy saucepan, heat 2 inches oil to 350°F. 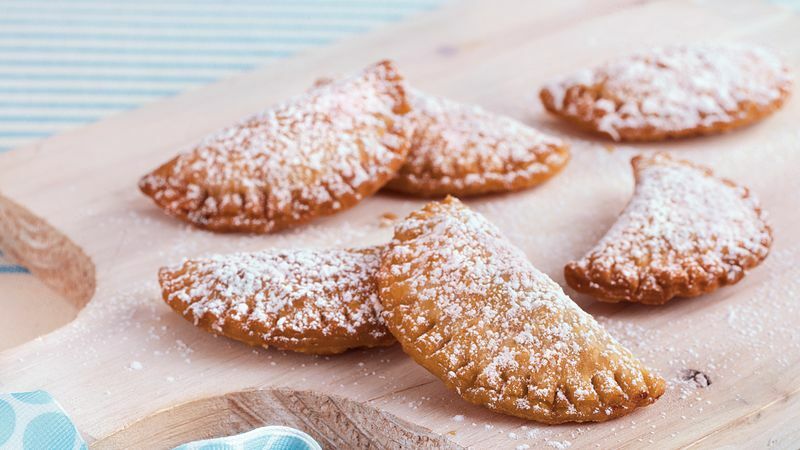 Fry pies in hot oil about 1 minute on each side or until golden brown. Drain on paper towels. Sprinkle powdered sugar over pies.